President Obama has exonerated and nominated Air Force Maj. Gen. John D. "Jack" Lavelle posthumously for advancement to the rank of general on the retired rolls, more than three decades after allegations he ordered the unauthorized bombing of North Vietnam. Lavelle, who was reduced by two stars in 1972, denied those charges until the day he died in 1979. But only recently, tape recordings revealed that the strikes were authorized by the White House and Levelle was used as a scapegoat. Lavelle was in charge of U.S. air operations in Vietnam in 1972. His pilots were increasingly getting hit by North Vietnamese fire, and he wanted to strike back harder. 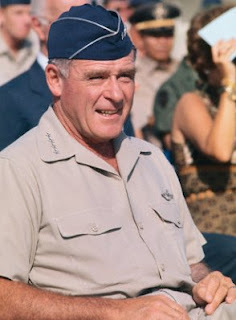 Defense Secretary Melvin Laird visited Vietnam and gave Lavelle approval to go ahead. There was a follow-up written approval from the Joint Chiefs of Staff. But all that remained secret until 2007, when researchers found tapes — maintained by the Nixon Presidential Library and Museum — of Nixon and National Security Adviser Henry Kissinger. A conversation from 1972 indicates Lavelle had White House approval for the stepped-up bombing. Congress was unaware of this at the time and neither did the USAF investigators who learned of the increased bombings and went after the general. Lavelle was recalled to Washington and relieved of command. He was unable to get a meeting with either Laird or top Air Force officials to defend himself. Lavelle was retired in the grade of major general, two grades lower than the last grade he served on active duty. In light of the new information, a request was made to the Air Force Board for Correction of Military Records for his posthumous reinstatement to the grade of general. Further, the Air Force Board for Correction of Military Records found no evidence Lavelle caused, either directly or indirectly, the falsification of records, or that he was even aware of their existence. Once he learned of the reports, Lavelle took action to ensure the practice was discontinued. The nomination to restore his four-star rank was recommended by the Air Force Board for Correction of Military Records, the SECDEF Gates and the Secretary of the Air Force. There's hope for you yet Colonel. yeah ..but the difference is...we all know the colonel's guilty! I am surprised that Fmr. President Bush didn't pardon the Colonel just before stepping down from office. Trouble in paradise, Colonel? You can only be pardoned for things you've been caught, tried and convicted of. I was pardoned of everything "known".